As a company, we are constantly on the lookout for ways to improve, especially when it comes to our production department. We’ve installed new machinery every summer for the past five years. This year, however, has seen some particularly big changes - £5 million’s worth of changes, in fact! Our most recent installation, the Heidelberg XL 106, linked up to a CutStar paper feeder. We’re very excited about our latest installation. It’s one of the most efficient litho presses manufactured as it’s the first press able to change jobs fully automated. It also uses LE UV inks which are touch-dry immediately after curing, dramatically reducing our make-ready times. We’ve already seen several new production records in our litho stream thanks to the new press. These advancements in efficiency mean that we can produce more of your print in less time. As a result, we’ve been able to release more litho flyer runs for same-day dispatch. The Heidelberg XL 106 is also linked up to a CutStar paper feeder which can display the length of remaining print stock on the reel. This helps eliminate press loading times and helps us reduce our paper waste. One of our two new Horizon Mark III Stitchliners. A large portion of our investments this summer has gone towards improving our booklet department. Horizon have completely re-engineered their stitchliners and our stapled booklets team has seen the introduction of the latest, highly efficient, model of Horizon Stitchliners – the Mark III model. 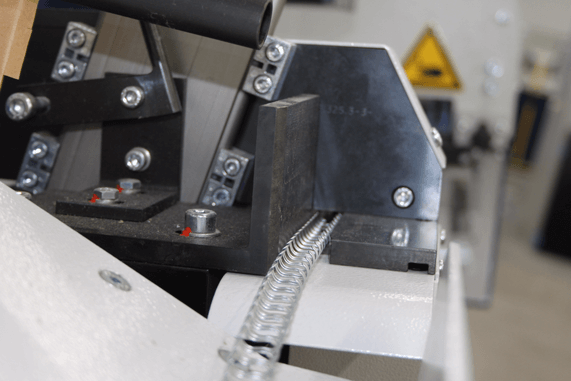 This model is able to easily switch between booklet formats, minimising machine downtime between jobs. Thanks to this improved efficiency and the model’s increased capacity, we can now achieve faster turnaround times and offer selected stapled booklets on a same-day dispatch service while also ensuring we continue to get jobs out of the door on time. Close-up of our new Renx MOBI 500, ready to bind booklets. Another improvement to our booklets department has come from the installation of a Renz MOBI 500 which has given us a whole new range of booklets – wiro bound booklets! These booklets can be another neat way to present large amounts of information but, unlike perfect bound and stapled booklets, they can also be used for other functions, such as calendars. They also make especially great instruction manuals due to their ability to lay open, flat, without be held. Our newly installed Fujifilm Jet Press in our partially built business card cell. Finally, we could not forget to mention the Jet Press. This is the printing element of our new dedicated business card production cell. The incredible advances in ink jet technology mean that this press brings together the quality of litho and the efficiency of digital. Moving over to a digital process also allows us to offer more special finishes to our business cards, including rounded corners and Spot UV. Head over to our blog all about the specific abilities of the Jet Press to discover why we chose it for the printing component of our business card cell. If you have any questions about the changes we’ve made, please do not hesitate to contact one of our Account Managers. They will even organise a factory tour for you if you would like to see the improvements in person.